I painted this bad boy for one of my friend's weddings in April. 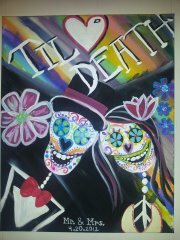 The two people I painted this for are fun loving, awesome, unique individuals and they are made for each other... I love the colors and this painting actually is a "re-do" over another painting... I have come to find that some of my favorite paintings are from me painting over previous unliked paintings. I will definitely be posting higher quality pictures soon but for now here is a preview!